Akshay Kumar is currently on the promotion of his upcoming period war drama Kesari, which is slated to release on this Holi, March 21, 2019. The trailer and songs of the movie have created tremendous buzz among moviegoers and the actor is also not leaving any stone unturned to make sure that the film does well at the box office. Kesari is a period war film based on real-life story of Battle of Saragarhi, where 21 brave Sikh soldiers fought 10,000 Afghani invaders and forced them to back off. Parineeti Chopra will be seen opposite Akshay for the first time in the film. Akshay Kumar has been making some patriotic and social issues-oriented movies. He is also known for his tremendous works in helping Indian armed forces. All these things led to rumors suggesting that Akshay is all set to fight an election in Lok Sabha 2019 from Punjab on a BJP ticket. However, Padman actor has rubbished all the rumors while talking to the media recently. He said that he is not looking to fight any elections, as politics is not his cup of tea. He also added that the work he has been able to do through movies won’t be possible if he joins politics. 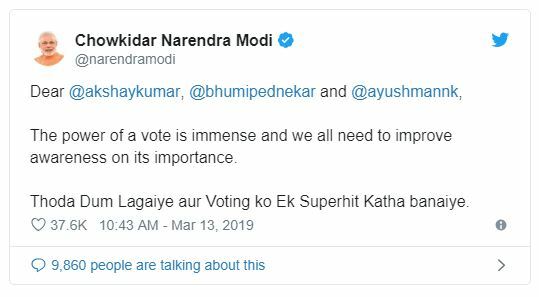 Responding to Modi’s tweet, Akshay Kumar said that voting needs to be a super hit love story between nation and the voters. 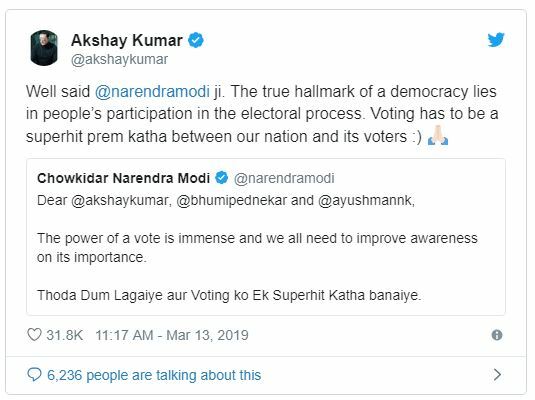 However, people soon started trolling Akshay Kumar and Narendra Modi because Akshay holds Canadian citizenship and don’t have any rights to vote in India because dual citizenship is not allowed here. Are you calling on Canadian citizen Rajiv Hari Om Bhatia (a.k.a Akshay Kumar) to assist in the elections? Er, isn't foreign interference of any kind in our elections an offence under Indian law? Sir, but elections toh India mein hai…aur aap toh Canadian ho..!! foreign influence in elections should not be allowed.!! A Canadian is coming in to promote Indian elections? Could have roped @JustinTrudeau too. I thought only a indian citizen can contest for the Lok Sabha elections….or has the rule changed…. Sir , Foreign nationals can’t contest elections in India & Akshay Kumar is a CANADIAN citizen .